Have You Ever Hooned A Work Vehicle? From tractors to skid loaders to forklifts, work vehicles seem like they were designed with one goal in mind: hoonage. Okay, they were really just designed for work, but they're perfect for hoonage, too. I consider myself thoroughly deprived of work vehicle hoonage. 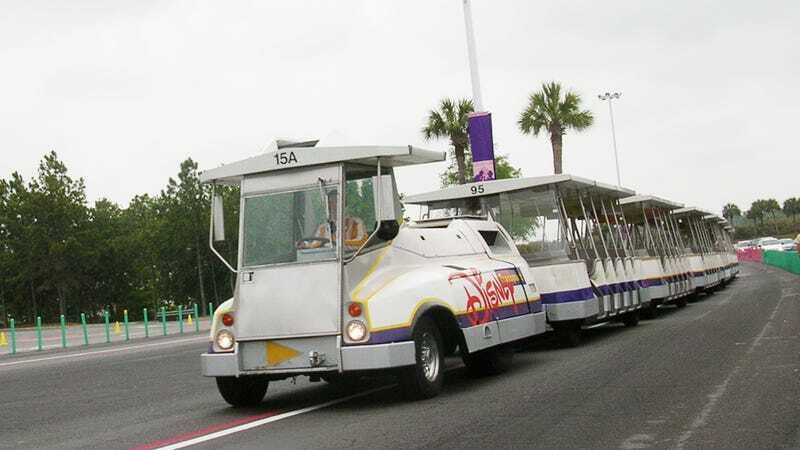 The only work vehicle I ever got my hands on was a last-gen Chevy Impala, and while I can describe its high-speed gravel road handling as exciting, I can't say I had anywhere near as much fun as tek_nic's coworkers at Disney World. Here's his story of their hoonage, which was told when we saw a frankly awesome airport baggage carrier burnout. I worked with a guy years ago who had previously worked at Disney World in guest services. He told me the story when I first met him, I didn't believe it... so he showed me pictures from google earth to prove it. Back when they had the parking lot road trains... ya know, the long trains with 6 or more trailers, and a pulling car similar to a baggage truck. These guys would fire it up in the middle of a parking lot, and immediately turn hard one direction or the other, then floor the throttle. What would happen is because the air brake system didn't have pressure built up yet, all of the trailers would lock their brakes. The little puller trucks have a surprising amount of torque... so they start dragging the entire chain in a giant donut. The end result was around 12 concentric rings of rubber, in perfect circles. And it was very visible on google earth. Funniest thing I have seen in a long time. Unfortunately, it looks like they are using regular buses now, and not the trains. Probably so they can offer A/C... or maybe because the employees were having too much fun with the trains! Sadly, the marks appear to be gone. Tek_nik wondered, "maybe somebody finally got in trouble for the fun." Either way, have you ever hooned a work vehicle? How'd that go for you, and for your boss? If you're worried about anonymity, I highly recommend using a burner account.